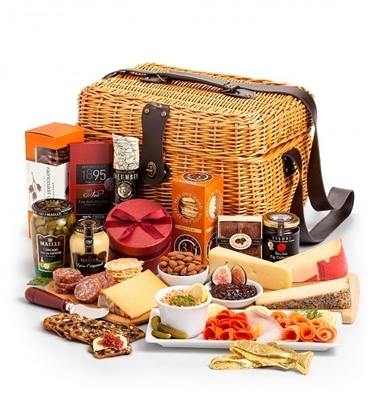 Ultimate Artisan Cheese Gift Basket. Packaged in a top-of-the-line insulated picnic basket, filled to the brim with premium cured meats including Wild Alaskan Sockeye Salmon, Smoked Rainbow Trout, Smoked Salmon Pate, Cold-smoked Alaskan Salmon Nova Lox, and Columbus Dry Salami. Gourmet artisan cheeses such as Sartori Basil & Olive Oil Asiago, Beemster Vlaskaas Dutch Gouda, Wisconsin BellaVitano Black Pepper, and Parrano Gouda are featured alongside sweet & savory pairing selections such as Flat Out Good Natural Crispbread, Maille Dijon Mustard, and Fig Cabernet Wine & Fruit Preserve. All of this and more arrives in a top-quality picnic hamper with leather shoulder strap and an interior zipper insulation system perfect for transporting hot or cold foods and beverages ($50 value). A most impressive gift, perfect for any occasion. Cold-Smoked Wild Alaskan Salmon Nova Lox. Basil & Olive Oil Asiago Cheese.